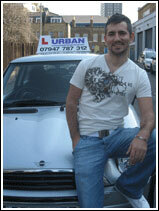 "My instructor got the job done, plain and simple"
Heurecat Loupimfou, passed second time, May 2007 at Loughton. Once you have passed your driving test, why not ask your instructor about the Pass Plus scheme. This course is aimed at 17-25 year olds and the legal minimum requirement is 6 hours tuition with your instructor. Pass Plus will further enhance your driving skills by taking you on roads that you will not experienced as a learner driver, such as motorways. The added incentive upon completion of the course is the substantial discount (up to 40%) you will receive from participating insurance companies once they receive your official Pass Plus certificate. The Pass Plus scheme will come highly recommended by our instructors and it will give you the maximum benefit as a new driver as well as saving you money on insurance costs. If you have held a full driving licence for some time and are no longer eligible for a Pass Plus certificate but have not driven on motorways or lack confidence on them why not book yourself a motorway lesson with Urban. These sessions are aimed at making you much more confident on motorways and all the different aspects of motorway driving such as joining and leaving motorways, overtaking, following distances, road signs and markings and much more. You will hopefully come back from your session feeling more confident with being able to deal with motorways and the different sorts of hazards you are presented with on them.